When the future holds only terror…precognition isn’t a gift. Cassandra McBeth sees the future, and it involves a night stalker and terror in Gatlinburg, Tennessee. But knowing the future doesn’t give Cassandra the answers to stopping what she sees in the terrifying images of her nightmares. Adam Raleigh believes in Cassandra and her visions. He stands with her when no one else will. But can she trust him? 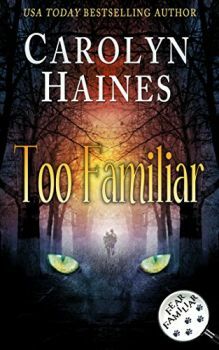 In a race against time, they seek the answer to the psychic link Cassandra shares with the person who haunts her dreams. Will her final vision end with the revelation and reality of her own demise? Help comes from an unusual source—a mysterious black cat called Familiar. Originally publised February 1993 in Harlequin Intibue #215 as part of the Fear Familiar Mystery series in mass market paperback.